One of the common notions about medical practitioners is that they are among the highest earning professionals anywhere. True enough, after spending years of training and studying to perfect their skills, doctors often reap the rewards of their labour once they have established a successful practice. However, as in any other profession, financial problems can also crop up in medical practices, particularly when no proper financial management is in place. 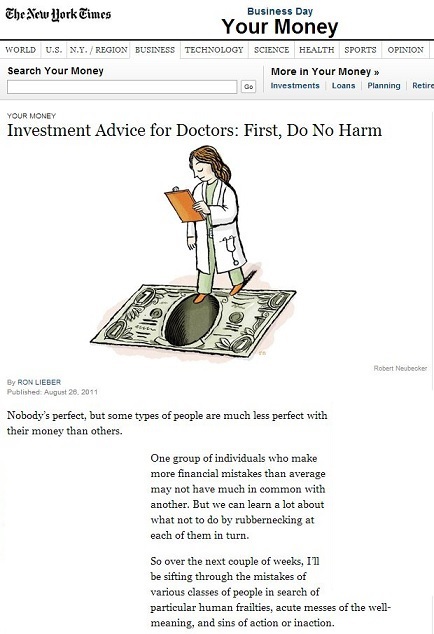 New York Times blog columnist and editor Ron Lieber even says that among all professionals, doctors are some of the most vulnerable to the effects of financial blunders. While they may commit the same mistakes as the rest of the population, the amount of money they make can magnify the effects of these mistakes a few times over. But in the world of financial services? Not so much. “Physicians are viewed as marks, because they are known to have money,” he said. This attitude of trust can also be a cause of concern among doctors who rely on others to keep their financial house in order. To avoid problems with their finances, they need to work only with trusted medical accounting specialists who will have their best interests in mind. All of these potential pitfalls make it imperative for doctors to work closely with reputable Sydney medical accountants like those in MEDIQ Financial Services. These financial professionals can not only help doctors keep their accounting records tidy and updated, but can also provide informed financial advices that can protect doctors from common and potentially costly investment mistakes.